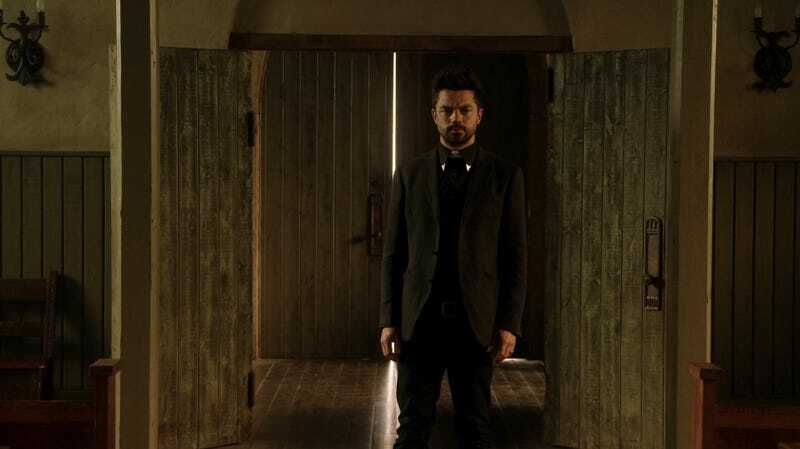 There are many reasons to check out Preacher on AMC, but one of them is the careful shot framing designed to add layers to the story without having to explain them. One way this occurs is with the Cormac McCarthy-inspired vignettes with the Virginian traveling through the land of scalps. Another was added this past week with the seventh episode, “He Gone,” wherein John Ford’s iconic 1956 western The Searchers becomes one of the show’s touchstone texts, and it does it through doorways. It all starts when Cassidy is vying with Tulip over who knows Preacher Jesse better, and Tulip asks the vampire who’s Jesse’s favorite actor, “Who does he think pretty much shits sunshine? Who would that be? After Jesse reaffirms Tulip’s affirmation, we get an overhead shot of the two on the bed, and the camera slowly pans back revealing a portrait of John Wayne on the wall. Why does any of this matter? Because of what happens next. John Custer’s call was to the Texas Department of Human Services, and they arrive the next day to take Tulip away to be raised by the state. Jesse is apoplectic, completely beside himself as he tries to fight with the social worker, with the car, with his dad, all to no avail, and he has to watch as his closest friend is taken away. And then we get this shot. John Custer inside the symbol of civilization, staring out at the wild wastes. That’s an iconic shot, and it comes from the John Ford/John Wayne joint The Searchers. Martha Edwards inside the symbol of civilization, staring out at the wild wastes. And if you know where that comes from, you know Jesse’s getting Tulip back. Recall that The Searchers is about a cowboy soldier named Ethan Edwards (played by Jesse’s favorite John Wayne), whose family are killed by Comanche warriors and his two nieces, Lucy and 8-year-old Debbie, are abducted. After his family has been raided and killed and his home destroyed, Ethan sets out on a blood mission to recover his nieces, or kill them if they’ve gone too native for his particular tastes. Because Ethan is a strange stranger. He fought for the Confederacy in the Civil War, but that war has been over for three years. What was Ethan doing? Ethan still has his sword, but Confederate soldiers handed over their swords at the surrender. The Reverend Samuel Clayton notes that he didn’t see Ethan at the surrender. Where was he? Where’d he go? Ethan may have fought in the Mexican revolutionary war, but it’s not clear. He does have gold coins and a medal from the Mexican revolution, but that doesn’t mean he fought there. The Reverend tries to deputize Ethan when they go to retrieve some stolen cattle, but Ethan says it wouldn’t be legal. That means Ethan’s an outlaw. And we come to learn that Ethan has an unnerving hatred for and knowledge of the Comanche tribe. He knows their religion, their customs, their language — he’s very, very familiar with a group he hates for a man who’s seemingly been off fighting in revolutionary wars for the past eight years. Suggestion: Rather than surrender at the end of the Civil War, Ethan skipped out and found himself among the Comanche people. He tried to live with them, learn their language and their ways, but was ultimately rejected by them. This seeds a hatred in Ethan that he can barely contain, and having become an outlaw to both the United States (as a Confederate) and the Confederacy (for not surrendering), he has now also become an outlaw to the Comanche, and lives the next few years as a complete outlaw, which is how he finagles his gold and the medal. That’s just a suggestion, but one that answers why and how Ethan knows so much about the tribe he loathes. The film itself is constantly framing its subjects within doorways and natural stone arches, setting up boundaries within boundaries that are being physically and metaphorically approached and crossed, such as Ethan’s multiple states of outlawness. The film ends with Ethan once more framed in a doorway after losing Lucy but returning Debbie to civilization (spoiler alert). But instead of re-entering the home, he turns and ambles off into the lawless wild. “I ain’t going back in there,” sez Ethan. And if Jesse is Preacher’s Ethan, the outlaw outside the door, that’s also re-iterated. But it’s not just that Preacher is re-iterating John Ford’s narrative. It’s doing something else, arguably inverting the iconic western. There are parallels, to be sure. John Custer is paralleled with Martha Edwards as emblematic of home and civilization. Tulip is paralleled with Debbie, both of whom were taken from their homes when they were children, and both partly wild. And of course Jesse is paralleled with Ethan, the outlaw who wanders back into the civilized realm from out in the wild. We see it in that shot paralleled with Ford’s shot; we know it from Jesse finding Tulip again; and we know it from the overall narrative, where Jesse returns to town to take over his father’s church. In a way, in Preacher we’re seeing a version of The Searchers that explores what it might look like after Debbie (as Tulip) has been returned and grown up. But if we want to know more of what drives Jesse, we can look at the ways Ethan is an outlaw multiple times over: He’s outside the law of the United States as a Confederate soldier who never surrendered; he may be an outlaw thief; and he may even be an outlaw to the Comanche people who rejected him (if you buy that line of argument). Jesse is similarly an outlaw from his family and background, having prayed for his father’s death and left town; an outlaw to the state, having lived as a criminal for a number of years; and an outlaw to his criminal past with Tulip, having rejected that to take up the pulpit at his father’s church. And if Ethan Edwards is any template to go by, Jesse will be turning and ambling back out into that wild in due time, maybe after Cassidy stops smoldering.